Learn how to calculate qualifying income using a cash flow analysis method. This practical, hands-on course is designed to walk the participant through a thorough analysis of self-employed borrower income by completing a full cash flow analysis. The case study includes analysis for a partnership (K-1/1065) and a corporation (1120). Participants will receive a cash flow worksheet (pdf) and a calculator (excel), which will aid in the application of their learning on the job. In December 2017, the Tax Cut and Jobs Act (TCJA) was signed into law. We will address key questions: How are the 2018 tax returns different from previous years? Will completing a cash-flow analysis change? What are the other implications to borrowers and specifically those that are self-employed? PARKING WILL NOT BE VALIDATED. Suggested parking: Alii Place OR Municipal lot at Beretania & Smith Click HERE for top 10 parking spots in downtown Honolulu. 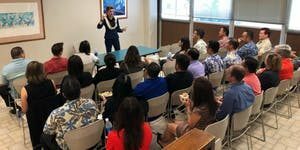 Mahalo to Essent for sponsoring our Presenter, Anthony Williams. And Mahalo to Territorial Savings Bank for sponsoring their conference room.